If you’re an NRI who is very particular about investment options, you will know that owning a home can prove to be a valuable asset. Owning a home in your native India is the best option, considering the incredible number of reforms that has made property investment a must-do in 2017 and the fact that the currency exchange rate may be in your favour. While the newly introduced RERA Bill has made home buying hassle-free, there are still some regulations NRIs have to comply with when looking for ways to finance their property purchase. 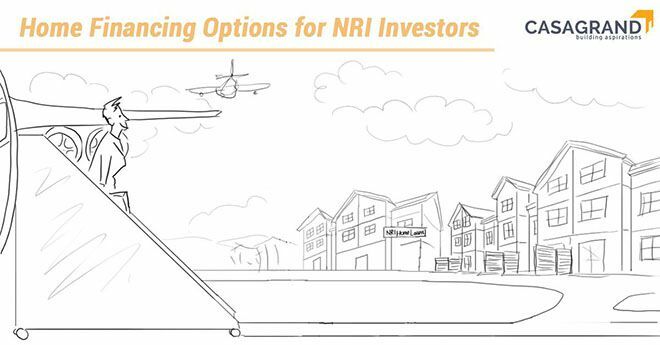 Here are a few home financing options for NRI investors. Any bank or housing finance company that is registered with the National Housing Board can give home loans to NRIs. The loan is given for purchasing land, apartments, constructing or renovating a house and there is no restriction on the number of commercial or residential properties an NRI can purchase or build. NRIs are not allowed to purchase or build property residing on agricultural land unless a residential Indian gifts that land. Banks cannot directly credit the loan amount into the NRI’s account; money has to be disbursed by the seller or developer of the property. All transactions relating to property purchase or sale must be done strictly in Indian rupees. NRIs can either use their Non-Residential External account (NRE), Non-Residential Ordinary (NRO) account or Foreign Currency Non-Residential (FCNR) account for sending and receiving funds. As per the Foreign Exchange Management Act, 1999, you are classified as an NRI if you’ve moved to another country under the pretext of working for or starting a business. A person is also considered an NRI if he/she has not stayed in India beyond 182 days after the last financial year. Just like residential Indians, NRIs will be eligible for home loans if the CIBIL score, pertaining to their country’s standards, are good. Also, salaried NRIs need to showcase a minimum amount (bank specific detail) in order to apply for a loan. NRIs need to be present in India for a specific amount of time to obtain the loan and can apply for the loan either offline or online. The RBI has restricted a maximum Loan to Value amount of 85 percent (subject to the applicant’s monthly income). Loan amounts may vary between five lakhs to five crores depending on the bank. However, for self-occupancy loans, the maximum amount for servicing the home loan is one crore. Unlike the long duration given to Indian residents, NRIs are only given tenure of five to fifteen years to repay the loan. The RBI has noticed that the average time to repay the loan amount is quicker with respect to NRIs, as they are more financially stable and have the currency conversion advantage. Interest rates on home loans remain largely similar to those offered to residential Indians (between 8 percent and 11 percent). NRIs may only repay the loan using their NRE, NRO or FCNR accounts. Even after returning to their country, NRIs can repay through Equated Monthly Instalments (EMI) through those accounts. If an NRI is short on cash, a residential Indian can transfer money to the NRE or NRO account to pay off the loan. If the property is Buy-to-Let, NRIs can use the rental income to pay off the EMI. As an NRI, when it comes to investing in Indian real estate, financing is a very critical subject. Make sure to keep all your mandatory documents in hand regardless of buying or selling a property in India. To get the most out of property investment, you must also keep a checklist of Do’s and Don’ts for NRI Investing. Remember, investing in properties produced by reputed Indian real estate developers like Casagrand is best, as it will ensure a stable and secure future for you and your next of kin.